We’ve taken an exhaustive look at several of the best garden pump sprayers on the market today. We’ve found that the best garden sprayer pump is the Chapin Sprayer because it can hold 2 gallons, is adjustable, and is also relatively inexpensive. 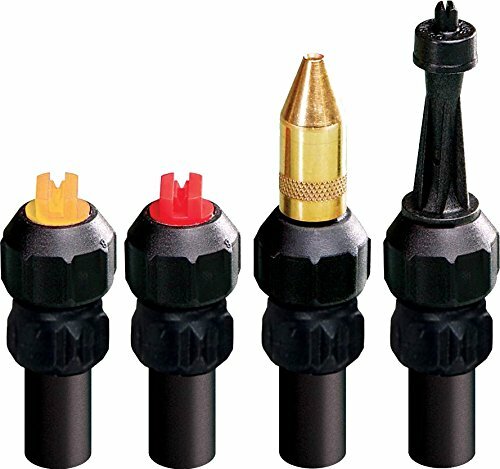 Its low cost is always a plus, and its quality sealing and changeable nozzle mean it won’t leak. The Chapin can target different threats like insects, weeds, or even simple plant dehydration with ease. It is the simplest product on this list to use and comes with convenient wand storage and a design that’s easy to clean, making it a personal favorite. For more information on the Chapin Sprayer, see the Product Reviews section below. In second place is the Field King Backpack Sprayer, which is the most expensive option but also one of the most reliable. It comes with four separate nozzles, can hold almost all garden chemicals on the market, and includes straps that give it a backpack design. It can also be adjusted to suit both right and left-handed individuals, and the hose and wand are reinforced and leakproof. The main reason it comes in second place is the price, but otherwise, it’s an amazing option for the average homeowner who needs a pretty high capacity sprayer. See the product reviews section for more information on the Field King. For those looking for a small, budget garden sprayer, the Planted Perfect Sprayer is a solid choice. It is the most inexpensive option on this list and is also one of the longest lasting in its price range. The basic design makes it easy to clean, and the bright colors are a pleasing aesthetic choice. This sprayer doesn’t come with any frills or extras but is great for those who want something simple that they can use again and again. See the Product Reviews section for more information on the Planted Perfect Sprayer. There are a few important considerations when shopping for a garden sprayer. The capacity of the sprayer is very important and is likely the most important single factor to consider. If you think you’ll be using the sprayer a lot, or have a large area to deal with, you’ll probably want to pick up a backpack sprayer. Otherwise, a 2-gallon sprayer is probably about as high as you want to go. Two gallons of liquid weighs about 16 lbs, and carrying more than that around with you without a backpack can be uncomfortable. If you’re going to be spraying a clear liquid out of the sprayer, it can be helpful to add a few drops of food coloring to the liquid you’ll be using. This way, you’ll be able to see how much liquid is left in the sprayer and will make the whole spraying process a bit easier. Some sprayers can handle virtually all chemicals, from herbicides to insecticides to liquid fertilizers to water. Others, however, struggle with certain chemicals like acids and bleach, which will ruin the seals over time and make the pump system inoperable. Some of the sprayers on our list use an adjustable nozzle, usually made of a poly material. Others use a swappable set of nozzles, usually some brass and some poly. Both systems can work pretty well, though the ones that include the multitude of nozzles may offer a bit more variations in spray patterns than the adjustable nozzle sprayers. In general, brass nozzles are better than poly nozzles. You want your pump system to be pretty easy to pump and to keep its pressure regularly without fail. Some pumps lose their pressure pretty quickly, meaning that you’re constantly pumping the system to get any spray out of it at all. Users should also consider the style of sprayer, and whether there is an included wand extension, or if the sprayer is hand-held. Both have their use cases, and buyers should consider how they will most frequently be using the sprayer. Hand-held sprayers are usually much smaller than wand-style sprayers, and are easy to store, easy to use, and tend to clog a bit less than wand-style sprayers. However, if you’re going to be mostly spraying on the lawn and to plants that are close to the ground, you’ll be bending down and kneeling a lot more due to the lack of a wand. Depending on what think you’ll be mostly using the sprayer for, this may be a major hassle. 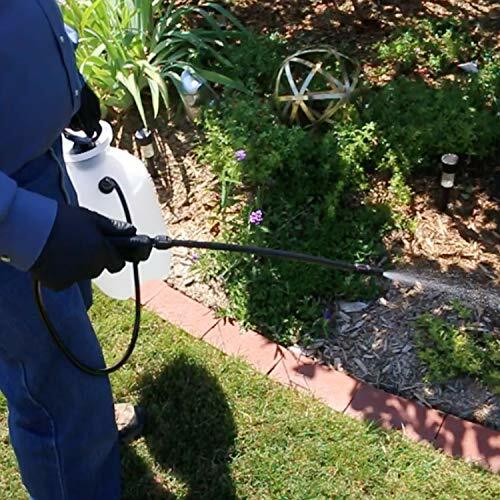 Wand-style sprayers are generally more convenient to use than hand-held sprayers when working in gardening applications, and usually hold a higher quantity of liquid in their reservoirs. They may clog a bit more than hand-held sprayers due to the added length they need to spray, and the more potential surface area that might clog up. They’re also a little bit more awkward to store and manage, especially those that are not backpack-style. Some of the sprayers feature drip protection, which is quite important when working with hazardous chemicals, bleaches, and the like. You don’t want to get that stuff on your body if you can avoid it, so options that protect against drip and errant sprays are a big plus. Reliability over time is an issue with these pump sprayers, and items like rubber seals will fail, and filters will clog up. You need to regularly check the filter on the sprayer to ensure that it’s not slowly clogging up, as clogs will prevent you from using the sprayer. O-Rings and Gaskets can fail, and depending on the model, you may be able to replace these. A garden sprayer is a manual or electric device designed to spray water, herbicide, and insecticides around a yard. They have a lot of uses, including targeting specific plants, eliminating weeds, and watering hard to reach flowers. Since they are so versatile, manufacturers tend to make their designs as simple as possible, but some sprayers definitely stand out with options like interchangeable nozzles, backpack straps, and tough valves and seals that don’t degrade. In this section, we’ll start with a comparison table to get oriented, and then move onto individual reviews. We’ll conclude with our favorites. Product Dimensions: 22.5 x 9.5 x 10 in. The Smith Contractor 190216 2-Gallon Sprayer for Weed Killers, Herbicides, and Insecticides is a powerful garden sprayer designed to use herbicides, pesticides, insecticides, and weed killers. It looks like a small white bucket capable of holding 2 gallons of liquid and features an attached 21 in. spraying wand. There is a pressure release valve that vents at 60 PSI to prevent the growth of too much interior pressure in the main chamber. The main chamber is translucent so users can see how much of the spray is left inside while in use. Upon purchase, this garden sprayer comes with a user’s guide. The main bottle features a wand storage space, and it uses viton seals to prevent leakage. It can handle most commercial sprays and fluids designed for outdoor uses. The Smith Contractor 190216 comes with four separate nozzles: one that adjusts from a stream to a mist, one that is wide and flat, one that is narrow and flat, and one that foams. That said, this unit is not a pressure washer, and it’s only going to put out about 50 PSI of liquid max. The Smith Contractor 190216 is a decent sprayer that one can get at a fairly low price point, making it a popular choice among the average homeowner. It doesn’t last as long as the more expensive models, but it holds 2 gallons and can handle most commercial garden chemicals. It’s a fine sprayer and is pretty well built, but it didn’t outshine the competition on any significant markers. Product Dimensions: 18.2 x 8.1 x 8.1 in. The Chapin International 617407731200 Chapin 20002 2-Gallon Poly Lawn, Garden, and Multi-Purpose Home Pro (Chapin Sprayer) is an easy to use garden sprayer that holds 2 gallons of fluid. A wand, hose, and adjustable nozzle are included so the user can choose whether they want a cone of liquid, foam, or a mist. The wand and hose make it easy for individuals to reach difficult places such as behind bushes and the cracks in driveways. The standard PSI operating pressure of the sprayer is between 40-60 PSI. This isn’t a pressure washer like the Sun Joe SPX3000, but it will eject a liquid with a bit of pressure. The Chapin Sprayer possesses a funnel top for easy filling and a translucent tank so users can see how much liquid is left inside. The sprayer has a black pump that users engage to prepare it for use. It features the company’s signature clog-free design and is compatible with most garden chemicals like herbicides, pesticides, and insecticides. The nitrile seals on the inside prevent leakage, and a 1-year warranty is included upon purchase. The max vertical stream produced by the Chapin Sprayer is 25 ft. while the max horizontal is 23 ft. The entire system can be taken apart to be easily cleaned and maintained. The Chapin Sprayer comes in at the top of this list because it is relatively large, doesn’t disintegrate from using slightly acidic chemicals, and comes with a 1-year warranty should anything break down. Product Dimensions: 12.4 x 6.5 x 5.2 in. 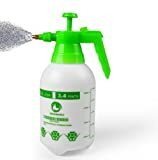 The Planted Perfect Pump Pressure Water Sprayers – 1L Handheld Garden Sprayer (Planted Perfect Sprayer) is a small, lightweight garden sprayer that weighs 11 oz. and can hold 0.5 gallons of liquid. It works best with water, insecticides, and herbicides. It’s made of simple plastic and is colored white and green. The Planted Perfect Sprayer is easy to use and comes with a plastic handle and an attached brass nozzle. It primarily forms a fine mist and is entirely leakproof. People who are unhappy with the product can return it for a refund. The interior of the main garden sprayer comes with chemical-resistant seals to prevent disintegration. 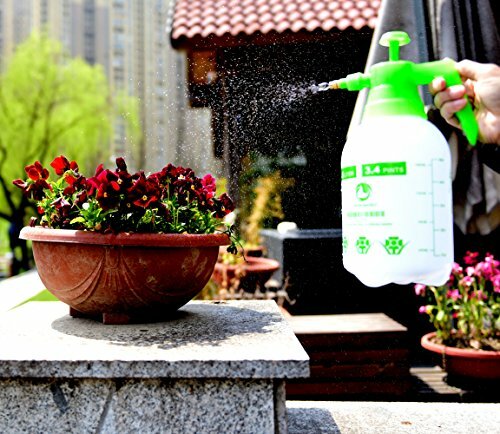 The Planted Perfect Sprayer is a very simple garden sprayer without any frills. One complaint people have about it is that it breaks easily because of the low quality of the materials. However, for individuals who want a basic garden sprayer, it’s not a bad option. Just remember that you may be kneeling down or bending over a lot relative to the wand-style sprayers. 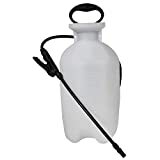 The TABOR TOOLS N-80, 2-Gallon Lawn and Garden Pump Pressure Sprayer (TABOR TOOLS Sprayer) is a 2-gallon garden sprayer that comes with a single shoulder strap for easy carrying. The main bottle is white and translucent so users can see how much liquid is left inside while the sprayer is in use. When empty, the product weighs 3 lbs. and has full product dimensions of 22 x 7.3 x 7.3 in. The top is shaped like a funnel for easy filling. There is a wand with a spray nozzle on the TABOR TOOLS Sprayer that can be adjusted for better use. Individuals do need to prepare and pump to pressurize the sprayer before it can be used properly. The materials used to make this garden sprayer are NOT compatible with caustic or acidic liquids, which means nothing with vinegar, bleach, or similar materials can be used. The product does work with most commercial garden herbicides and pesticides. This product can handle liquids that are as hot as 131 degrees Fahrenheit. Customer service is available to solve any problems with the sprayer. Users get what they pay for with the TABOR TOOLS Sprayer, and it’s sadly not much. While this garden sprayer is great while it lasts, the internal seals tend to break down quickly. Many users have had problems after using acids like vinegar, or bleach, with the Tabor Tools Sprayer. 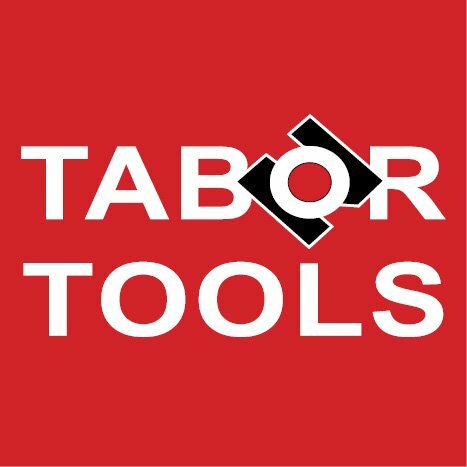 Additionally, some have reported struggles dealing with the warranty department at Tabor Tools. This, coupled with a somewhat high price point, makes this a less-than-ideal choice. MULTI-FUNCTIONAL. 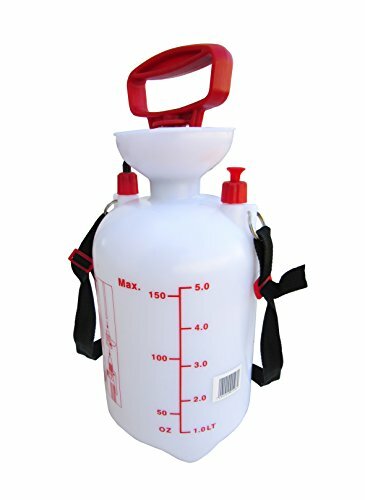 Practical 1.3-gallon compression sprayer for indoor and outdoor use. This sturdy sprayer is compatible with most commercial liquid fertilizers, weed killers, pesticides, herbicides & fungicides. This product is also suitable for spraying water up to 131°F and for solvent-free mild pest control chemicals (PH range 5-8). NOT suitable for caustic or acidic (vinegar) solutions. EASY FILLING. Funnel top opening allows for easy no-mess filling. Simply unscrew, fill up the bottle, and close the lid. Pump up the pressure and you are ready to go! TRANSPARENT BOTTLE. Check the fluid level is visible through the translucent bottle. You will know exactly when to refill! PRACTICAL SPRAYING WAND. Enjoy a better reach and work standing up straight with the help of the sprayer wand. The sprayer comes with shoulder strap, so you can save your back. The comfort-grip handle has a shut-off valve, so you can rest your hand while keeping a constant flow. ORDER WITH CONFIDENCE. The TABOR TOOLS customer satisfaction guarantee means exactly that. We will fix any problems quickly and answer to your need every time. We are always available to help our customers; our service record is unmatched! Full Product Dimensions: 15 x 22.5 x 9.5 in. The Field King Professional 190328 No Leak Pump Backpack Sprayer (Field King Sprayer) is a backpack-style garden sprayer capable of holding 4 gallons of fluid. It weighs 12 lbs. when empty, and could way up to 44lb filed with four gallons of liquid. Fortunately, its backpack design makes it pretty comfortable to carry, and its no-leak system is designed so users don’t wind up with chemicals dripping down their backs. The product is made of durable material and designed to be efficient. 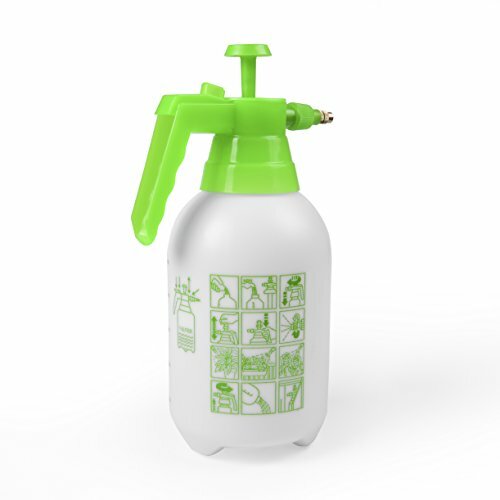 The manufacturer recommends that the garden sprayer is used with water, herbicides, pesticides, and other traditional outdoor chemicals. The Field King Sprayer is black and white, and comes with a wand attachment that is 21 in. long. The Field King includes four different nozzles that affect how fluid is sprayed. One creates foam, one is wide and flat, one is narrow and flat, and one can create a cone of liquid. The nozzles are both poly and brass. The interior of the sprayer has paddles and pressure control mechanisms that help the internal pressure of the device reach 150 PSI — a much higher amount than other sprayers, but still well below what a pressure washer can achieve. There is also a filtration basket to prevent debris from getting inside and gumming up the works. A one-way valve at the top of the garden sprayer prevents spills and locks tight to stop leaks. Wand storage is attached. The Field King Sprayer has a reversible pump handle, meaning it can be adjusted to suit right and left-handed individuals. If someone can invest the money, the Field King Sprayer is a great investment. The design is solid, the Field King is durable, and the presence of four nozzles means individuals can tailor the nozzle to their spraying needs. The higher Max-PSI is welcome and will make spraying a breeze. The fluid pressure can also be changed, allowing users to reach difficult areas and not hurt any plants that might need to be sprayed. 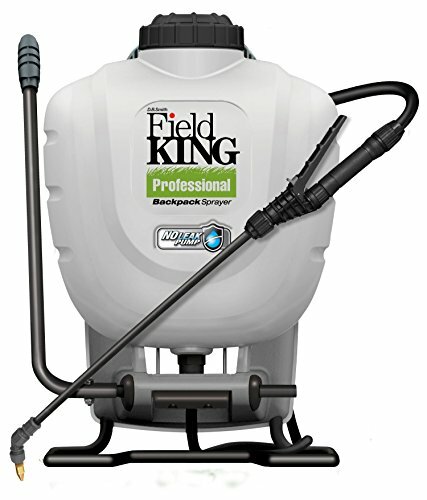 Overall, the Field King is the best backpack garden sprayer on the market and will serve you well for years. It’s costly, yes, but it’s high powered and has a large capacity that is great for those who need to deal with large areas. 4 nozzles included: brass adjustable, 2 flat fans, and foaming nozzle. Also accepts Tee Jet nozzles. The Solo 418 One-Hand Pressure Sprayer (Solo 418) is pretty similar in format to the Planted Perfect sprayer above and is designed to be held in one hand. However, it’s about half the capacity of the Planted Perfect and can hold 0.25 gallons, or 1 liter of fluid. The entire bottle is made of durable PVC and includes chemical resistant seals. Whatever is put inside shouldn’t eat through the sprayer. It can be rinsed out and reused as needed. The Solo 418 creates a fine mist or a regular spray depending on the application needed. The nozzle is multi-directional, meaning it can be adjusted as needed to point in multiple directions. 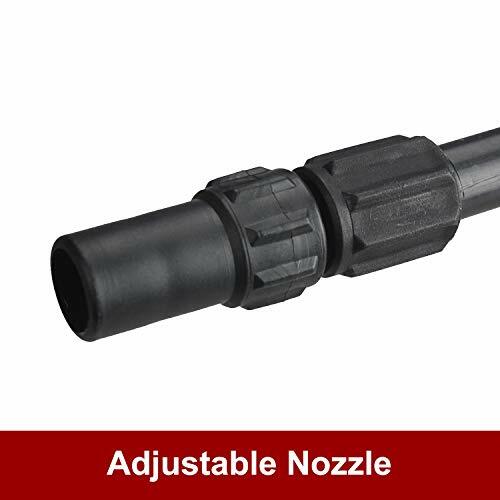 Around the nozzle is a drip or drift guard, which catches any potentially leaking liquid so pesticides or herbicides don’t spill on the ground. While empty, the garden sprayer weighs 1.5 lbs. The handle is comfortable to hold and includes a pressure relief valve so the user can control how much fluid sprays. Some of the liquids that the manufacturer recommends for use in the Solo 418 are pesticides, herbicides, water, woodwork coating, sanitizing and disinfecting liquids, and waterproofing fluids. The Solo 418 sprayer is adjustable, inexpensive, and generally easy to use. The main downside to this garden sprayer is that it’s relatively small, so it can’t hold a lot of fluid. For people with larger yards or gardens, this sprayer won’t work. However, for those with small to average-sized yards, you may find the Solo works pretty well. Just keep in mind you may be bending down a bit more than you would with a wand-style sprayer. It’s a fan favorite, and will be an excellent choice for many. When it comes to a garden sprayer, different people will have varying needs and budgets. However, no matter the situation, the Chapin Sprayer is definitely the best option because it’s affordable, can be adjusted to suit different purposes, and even comes with a warranty. It’s inexpensive enough to be somewhat disposable, but it works better than most. For those who need a high capacity backpack style sprayer, the more expensive Field King is a great choice. Finally, individuals who just want something simple and basic can’t go wrong with the Planted Perfect. No matter what the situation may be, there is a sprayer available. Take the garden back from pesky pests and weeds, and enjoy the wonders of healthy, beautiful plants.